What a day today has been. While I wish I had been able to partake with the masses and venture off to D.C. for the inauguration that was not in the cards. I was lucky enough to be able to watch it live from work. I loved every bit of it. I was/am an Obama supporter so I was thrilled to see him become our 44th President. While Obama gave a fabulous speech that reached out to many the person that got my undivided attention was little Ms. Sasha Obama. What a cute little lady with such personality. 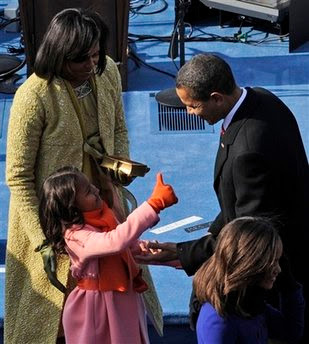 I loved when she gave him the thumbs-up. I agree with Ms. Sasha and even though I find giving the thumb's up a tad cheesy I raise my thumb today to our new leader. I can't wait to see what he does. Aw, I haven't seen this picture. You just know she's going to be the one who will keep them on their toes. I agree! Sasha has such an adorable personality-very sweet with a touch of sass. The White House could use a bit of that. That is the cutest picture ever, I love it!! I cant wait to see what they end up wearing tonight, they are going to look like such little ladies all dressed up! My eyes were on them as well. They are totally adorable! I loved the thumbs up! She is such a cutie. What a day. What a cutie! I hadn't seen this photo until now. It will be such a delight to see this family grow before our eyes!